Discussion in 'Videocards - AMD Radeon' started by BadrM, Oct 18, 2018.
is the rx460 drivers very new for my old motherboard? I updated my drivers to the latest version, should I downgrade to an older version? I also tested my memory with memtest all fine no problem with 8 passes and the system is pretty stable I never got BSOD except only while gaming. the BSOD is with bug check code 0x00000109 and caused by driver ntoskrnl.exe according to bluescreenview. RX 460 fit to your mobo, but it will run on PCI-E 2.0, doesn't matter at all. I think it's not GPU fault. I found solution on polish site. Give a shot. Remove GPU drivers from Device Manager, restart PC and do fresh install of Radeon Adrenalin. No more crashes. You may also look into a bios update if one is available. I do have the latest bios which is a 2013 version and no more updates from Gigabyte. You could just check the setting of your memory and if possible try to increase the voltage by 0.1 where possible. Could be that your memory gets unstable when stressed and just requires a bit more voltage. another thing, since it seems to happen under gaming, is you PSU could be acting up. From your profile, it looks to be fine. I think my PSU is overkill for the components it's a Seasonic 600w ECO series, it's around 3-4 years old, could it be the problem? or it's more likely to be the old CPU+mobo. Just a PS. before I swap to the RX 460, I used HD 5770 and the system was stable with BSOD free while gaming. Most likely not the PSU. I was not sure how old it was. Another thing to look at are temps. 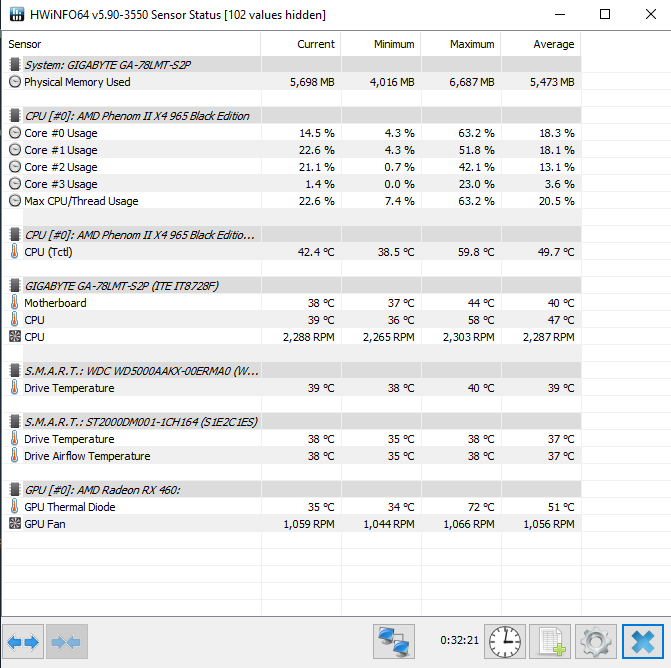 What are the temps like on your system, especially under load like gaming. How about your CPU? Do you have fluctuating voltage? Try with fixed voltage if that is the case.